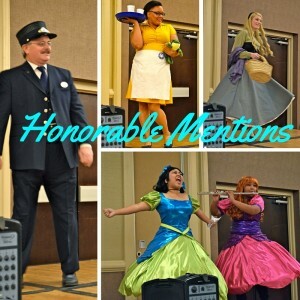 I had the honor of attending Mouse-Con’s 1st Annual Disneyana Fan Convention in Concord, California and it was absolutely amazing! 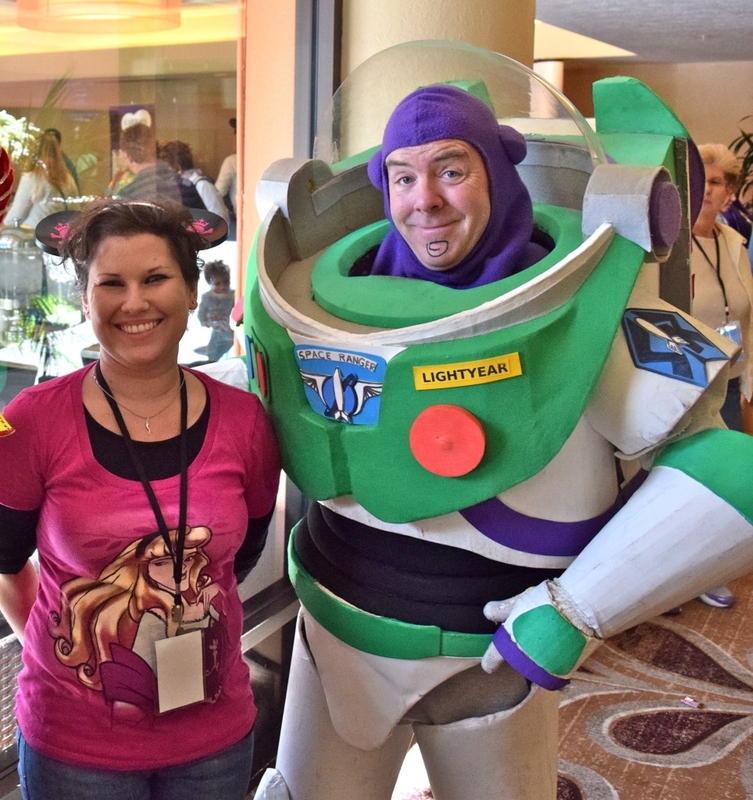 It was so fun to be a part of was Mouse-Con’s Disney Costume/Cosplay Contest. I have to say, the costumes did not disappoint! Even the three judges got into it and dressed up as Jane from Tarzan, Esmeralda888 from The Hunchback of Notre-Dame, and Buzz Lightyear from Toy Story. The Buzz Lightyear costume was very impressive and definitely my favorite, so of course I had to take a picture with him (Pictured below). 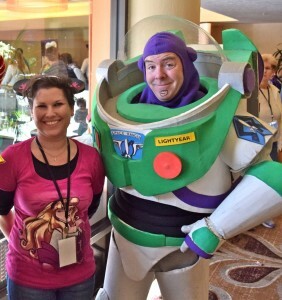 I asked “Buzz” how long it took him to make his costume and he said five months. Can you believe it? That is pure dedication. He definitely had it down to a T too with the squiggle on his chin and even working buttons on his chest that said “Buzz Lightyear to the rescue!” Well done, Buzz! The contest was broken up into two categories: 1. Adults (16 years and older) and 2. Children (15 years and younger). Each category had four awards: 1. First Place, 2. 2nd Place, 3. Third Place, and 4. Fan Favorite. 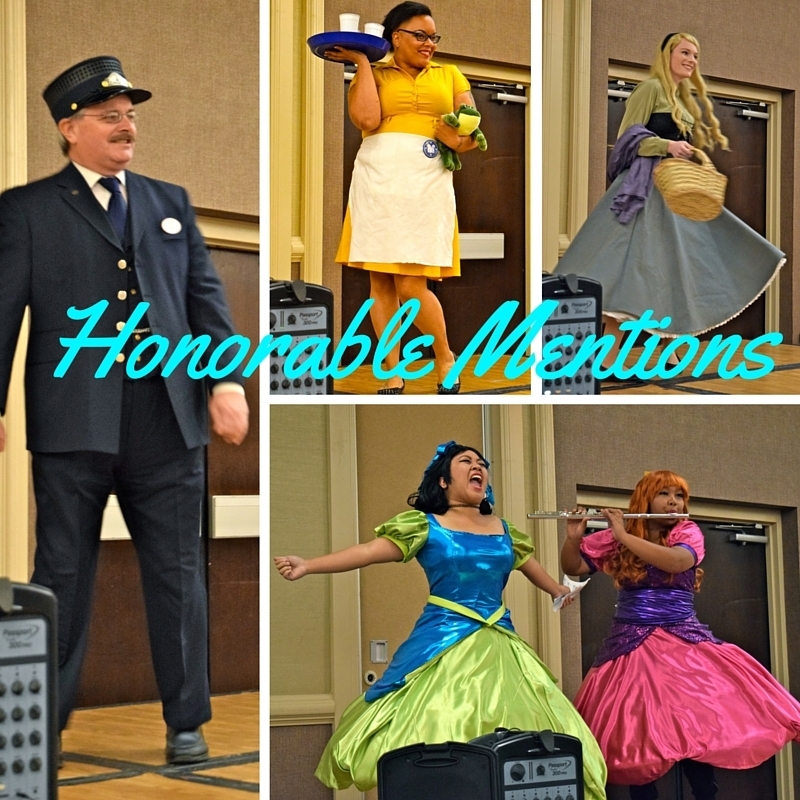 Fan Favorites were awarded to those who received the most applause when they walked onto the stage to show off their magical costumes. Some of the contestants got really into character, which the audience loved of course since everyone there was a big Disney nerd like me (I say that with love). Adults Contest: Although there were many great costumes, First Place for the adults went to Ariel from The Little Mermaid. She made a beautiful Ariel and the shell she sat on was astonishing. It was decorated with starfish, seaweed, and even Ariel’s sea friends, Flounder and Sebastian! A lot of thought and creativity went into it, so I am really happy she won. Second Place went to Shego from Kim Possible, who I have to admit I was unfamiliar with, but her costume was pretty cool. 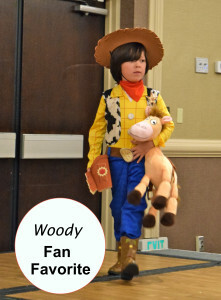 Third Place went to Jessie from Toy Story, who was so adorable. 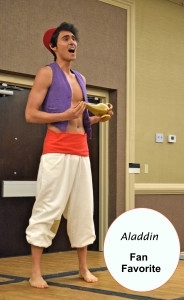 The Fan Favorite went to Aladdin from Aladdin. He was so into his character, he wasn’t even wearing shoes! He got a pretty big applause from the ladies too when he sang the reprise of “One Jump Ahead” and sounded just like the real Aladdin. Not bad for a street rat! Just kidding! Children’s Contest: All of the children participating in the costume/cosplay contest did a great job as well. 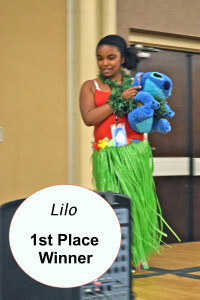 First Place for the children went to Lilo from Lilo and Stitch. Personally, I thought there were better costumes, but the little girl made a very cute Lilo and even had her pal, Stitch (a stuffed animal), by her side. Second Place went to Donald Duck’s beloved nephews: Huey, Dewey, and Louie. The trio did a great job of helping us relive our “Disney Afternoons” of watching DuckTales (“Woo-oo!”). Third Place went to baby Mike Wazowski from Monster’s Inc., who was accompanied by his mother dressed as Sully from Monster’s Inc. The pair was so cute! Fan Favorite went to Woody from Toy Story, which was super adorable. He made a great rootinest tootinest cowboy with a pull-string on his back and his trusty steed, Bullseye (a stuffed animal), by his side as well. 2. Tiana, The Waitress – I really liked her costume, because we usually only see Tiana in her green “froggy” dress. 3. Aurora – I also liked her costume for the same reason I liked Tiana’s. We usually only see Aurora in her pink (and sometimes blue) dress. 4. 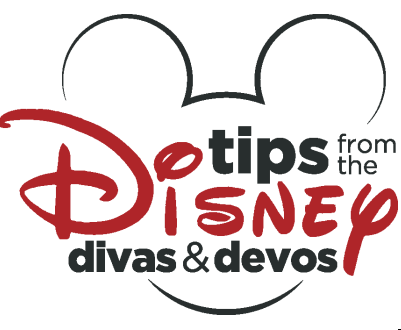 Drizella and Anastasia – These ladies were spot on! They even performed the whole “Sing Sweet Nightingale” scene, complete with flute! 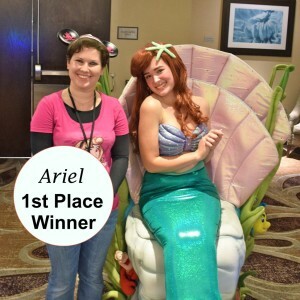 Thank you very much to all of the contestants in Mouse-Cons’s 1st Costume/Cosplay Contest! I am looking forward to next year’s already! For more information on Mouse-Con, please visit their website.